At the beginning of 2014 I made a resolution to get out into the Surrey Hills more with my camera. The Surrey Hills is a designated Area of Outstanding Beauty, and forms part of the North Downs Way. Newlands Corner, Box Hill, Leith Hill and far more besides offer fantastic views that stretch for miles, and there are many photogenic hotspots in between. I’ve spent a fair amount of time photographing at Newlands Corner, and a little at Denbies Vineyard and the Hogs Back, but beyond that I hadn’t really done it justice. 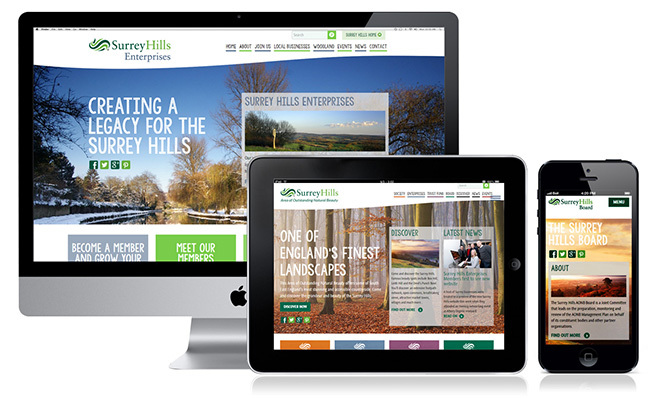 By day I work as the Creative Director at Akiko Design, and late last year we were approached to pitch for the redesign of the Surrey Hills website. To me, this felt like fate. If ever there was a project that was made for me then this was the one. Here was the chance to combine my love of design with that of photography and the great outdoors. Their current site wasn’t too bad, albeit a little dated, but I wanted to create a visually stunning site that centred on imagery of the beautiful countryside and views. I wanted to create a clean, uncluttered site, with bold colour schemes to denote different sections and distressed type to give a sense of adventure. We were fortunate enough to win the pitch, and the following months were a real labour of love as we refined the look and then built the site. We built the site using WordPress, and used a responsive framework to create a site that looks great on desktop, tablet and mobile. One of the things we were keen to achieve was to give users the ability to plan days out, whether that be walking, cycling or driving, whilst actually on the move, using their mobile devices. Users can now plan their route, view interesting places to visit, where to eat and drink, and even where to shop. Cyclists and walkers can view interactive maps that plot suggested routes. Local businesses benefit too. A business directory gives members the opportunity to promote their goods or services to a far wider audience, and when users view a particular area on the map then local businesses will also be displayed. We worked closely with Carol and Caroline at Surrey Hills throughout the whole process, and whilst there was a large volume of work, I can honestly say it was one of the most pleasureable projects I’ve ever been involved with. A big thank you to Van for all his work on the build, a WordPress master! The pre-launch preview was held at Albury Vineyard on Wednesday 21st January, and was extremely well received by those that attended. We discovered that most Surrey businesses are involved in alcohol production, or so it seemed from the number of speakers involved in Distillery! This was no bad thing however, as there was plenty to sample on the night! Carol Hornsby-Smith and Caroline Price from Surrey Hills, alongside some of the Akiko team, Vanden Horner, David Evans and a hobbit that appears to have photo bombed. Oh hang on, that’s me. 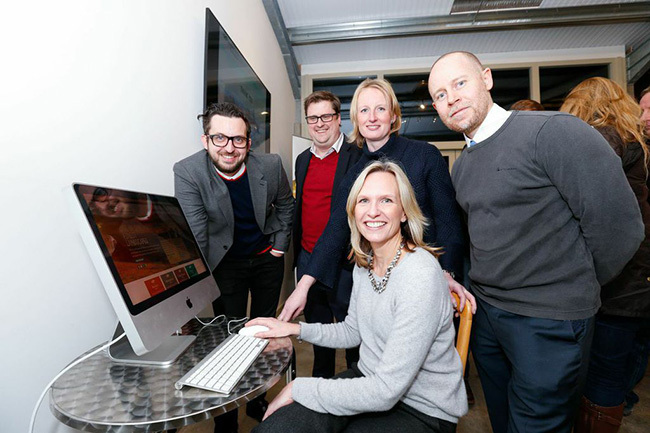 The site was then officially launched on the 26th January, and it was very satisfying to see all our hard work come to fruition. A number of my photos feature alongside the fantastic work of John Miller, and I’m very pleased with how it all looks. Hopefully my passion for the project shines through in the design.